FREE Self-Care Guide: Relieving Headaches In Minutes | Center for Healing By Design, Inc.
Do you suffer from chronic migraines or occasional headaches? Would you like to learn how to relieve your headaches in minutes without drugs by yourself? 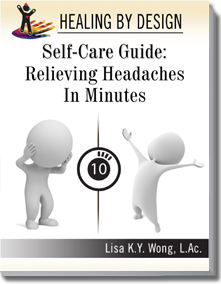 Get my free eBook – Healing By Design Self-Care Guide: Relieving Headaches In Minutes. To Get your FREE copy of this guide, fill out the form on the home page. I developed a really bad bad headache. I was almost to a point I wasn’t able to function. I sat down with Lisa. I was a little skeptical at first. But within 15 minutes, she had taught me not only how to heal my headache at the moment, but how to take that information she gave me so I can heal myself. And my headache within 15 minutes was gone. Now I feel empowered that I can actually heal myself with the information that she gave me. I am so grateful to her. I woke up with a headache. At 8 o’clock I took 2 Advil, it didn’t go away. At 11 o’clock, I took 2 more. Seven hours later, the headache still was bothering me. I found Lisa and she taught me a couple of trigger points on my body that I can use and in 10 minutes she got rid of the headache for me. Even better, when I feel the headache coming on, I know where to go on my body to deal with those trigger points and erase the headache, so Lisa, thanks so much!